The Suzuki-Miyaura Cross-Coupling reaction was first published in 1979 by Akira Sazuki and Norio Miyaura. It is also known as the Suzuki–Miyaura reaction or Suzuki coupling. It is defined as the cross-coupling of organoboron compounds with organic halogen containing molecules, catalyzed by palladium. The reaction is important to organic chemistry because it forms carbon-carbon bonds allowing the synthesization of various organic molecules. The discovery of palladium-catalyzed cross couplings was awarded the 2010 Nobel Prize in Chemistry. The Suzuki-Miyaura reaction is best described as a catalytic cycle where the catalyst is regenerated. Oxidative addition: Where the oxidative state of a metal centre is increased. For the Suzuki-Miyaura reaction, the oxidative addition of palladium to the halide occurs forming an organopalladium species. Transmetalation: A reaction with the base forms an intermediate before there is a transference of ligands between metals. For the Suzuki-Miyaura reaction, the transmetalation occurs with the boron-ate complex. Reductive elimination: The oxidative state of the metal center decreases to form a new covalent bond between ligands. This produces the desired product from the diarylpalladium complex and restores the catalyst. The Suzuki-Miyaura reaction requires the addition of a base to activate the boron compounds. The base is involved with the formation of the palladium complex and trialkyl borate as well as accelerating the final elimination step. The reaction leads to the synthesis of biaryls, which are important compounds in many fields including industrial chemistry and pharmaceuticals. Biaryls are classed as privileged structures; this means they are compounds with a high affinity and are capable of binding to multiple receptors. Therefore, they are utilized in a wide range of pharmaceutical products as a key step in producing bio-active molecules for medicines. The Suzuki-Miyaura reaction also produces other products with carbon-carbon bonds in the form of alkenes and styrenes. Advanced materials such as light-emitting polymers have previously been assembled via the reaction. The method has also proved useful in producing polymers for electronic chip insulation and for the compounds used in organic light emitting diodes. The products produced by the Suzuki-Miyaura reaction may have significant roles in the new field of nanotechnology, utilizing organic materials with electronic, optical and mechanical properties. The use of organoboron compounds as a reagent provides high selectivity and stability in cross-coupling reactions as well as being non-toxic. The reaction forms an inorganic boron-based by-product that is also non-toxic and can be easily removed. This means the Suzuki–Miyaura reaction is particularly suitable for large scale synthesis in industry. Another key advantage is that the boronic acids required for use as a reagent are widely available. Boronic acids are also noted for being stable when in contact with heat, oxygen and water. 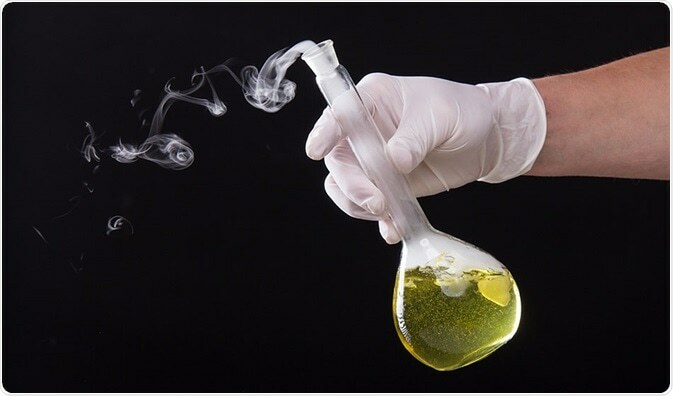 Due to the promotion of green chemistry, where there is a focus on the sustainable development of research, the Suzuki–Miyaura reaction has been modified in recent years. The reaction can now be stimulated using water used as a solvent, representing a more environmentally friendly way of producing the desired product. Base: A substance that can neutralize an acid but does not dissolve in water. Reagent: A substance added to cause a chemical reaction. Intermediate: A short-lived substance formed during the middle step of a reaction. Ligand: The coordinate bonding of molecules attached to a metal atom. Biaryls: A structure containing two aryl groups. An aryl is an organic group in a planar ring formation consisting usually of a hydrocarbon with a hydrogen atom removed. Kotha, S. et al. 2002. ‘Recent applications of the Suzuki–Miyaura cross-coupling reaction in organic synthesis’, Tetrahedron, 58, pp. 9633-9695. Horton, D.A. et al. 2003. ‘The combinatorial synthesis of bicyclic privileged structures or privileged substructures’, Chemical Reviews, 103, pp. 893-930. Amatore, C. et al. 2011. ‘Kinetic data for the transmetalation/reductive elimination in palladium-catalyzed Suzuki–Miyaura reactions: Unexpected triple role of hydroxide ions used as base’, Chemistry, 17, pp. 2492-2503. Martin, R. & Buchwald, S.L. 2008. ‘Palladium-catalyzed Suzuki-Miyaura cross-coupling reactions employing dialkylbiaryl phosphine ligands’, Accounts of Chemical Research, 18, pp. 1461-1473.